Trophy Brewing on Morgan Street. June 2018. Trophy Brewing is expanding. 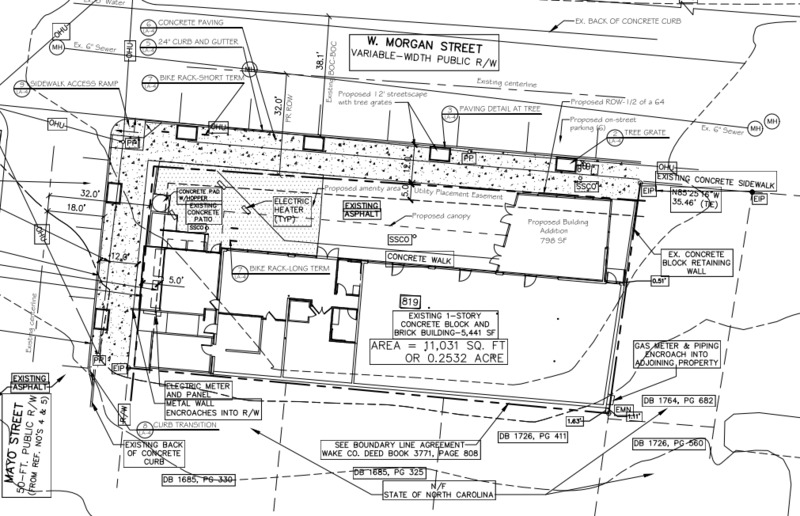 The brewery that started in a small retail building along Morgan Street has taken over the entire building now and site plans were submitted for a small expansion. 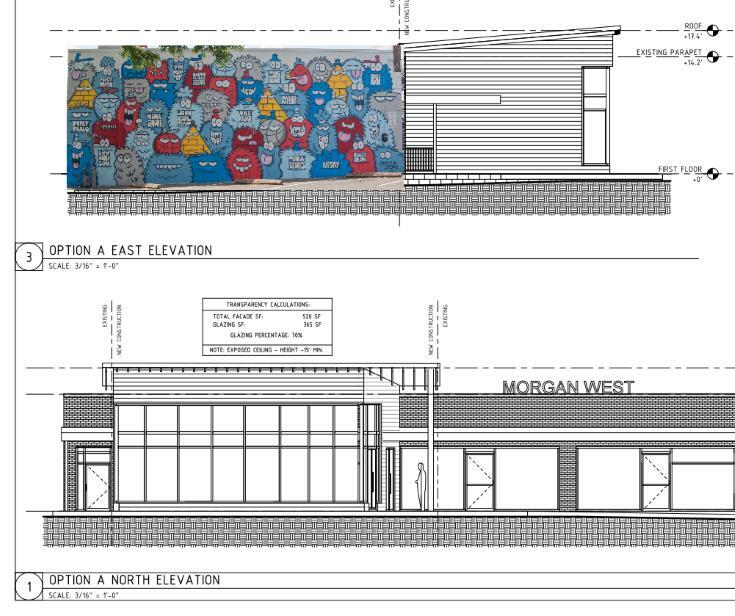 The plans suggest that more of the angled parking in front will be used for outdoor space and some for a small building expansion. The new space should be finished by next Summer. Not much else to report on this. It is great to see a downtown brewery expand due to, I’m assuming, continued success. 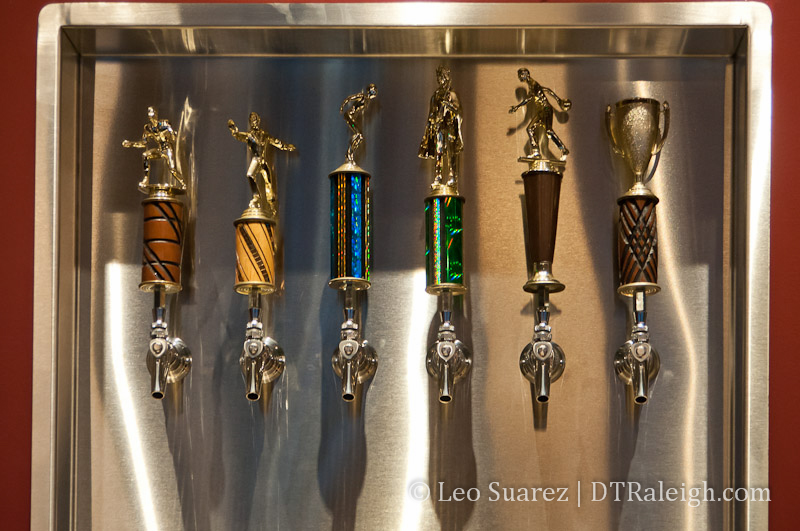 Some of Trophy’s beers are at the top of this blogger’s favorites for sure. Go Raleigh beer! The craft beer choices within the bars, shops, and restaurants in Downtown Raleigh are some of the most varied and plentiful compared to the rest of the city. Downtown has several bars that only serve craft and there are many occasions where patrons ordering Bud or Miller are trying something new. Coming soon are two new offerings for downtowners to sip on. 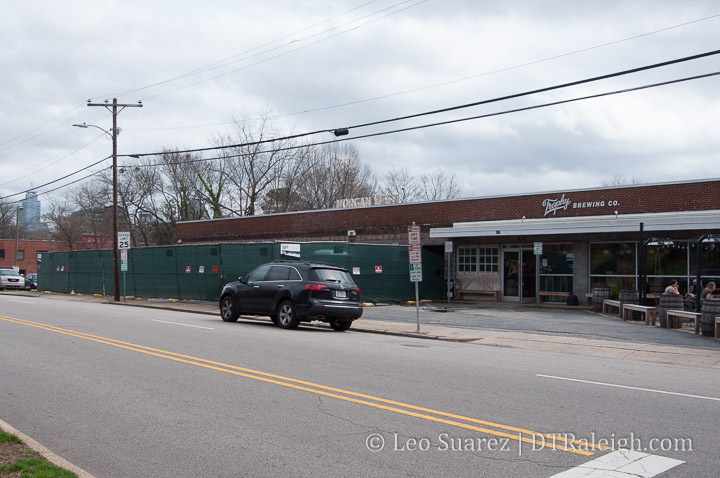 Trophy Brewing Company, a new project by those behind the Busy Bee Cafe, will be serving seasonal beers in the former Burger Hut location on Morgan Street. 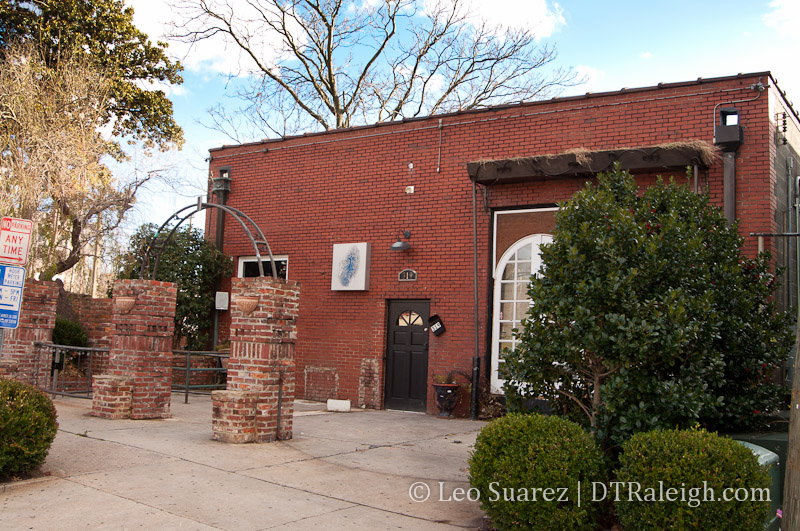 Set to open in February, the small brewery stays true to its homebrew roots. 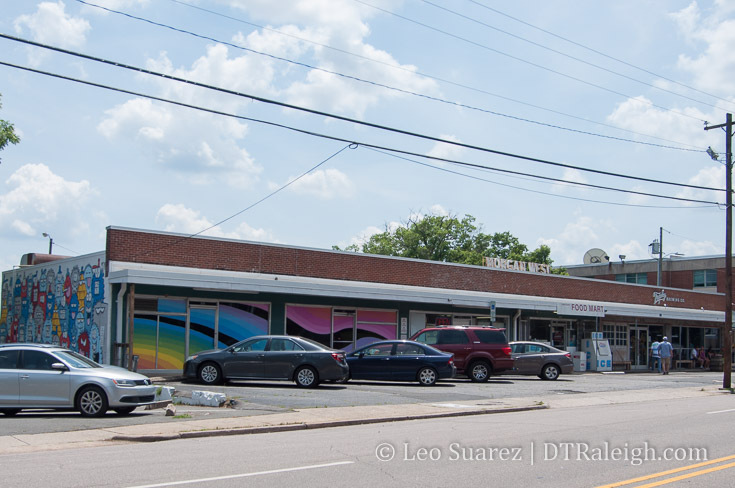 I stopped by Trophy recently and talked to David Lockwood and Chris Powers about the new place. With a glass of “Batch #1” in my hand, they took me through the tasting room and the brewery room. Brewer Les Stewart was there, wading through a web of wet hoses as he explained their brewing process. “Stainless steel is a beautiful thing,” he said while wrapping up for the day. This guy is genuinely excited about taking on the challenge of running this small brewery. Size is not something Trophy is concerned about right now, the place is already full of equipment. With that, you’ll most likely only catch Trophy’s beers on Morgan Street. Since experimentation is so key to the guys behind the new brewery, expect new tastes every season by Trophy or through collaborations with others. 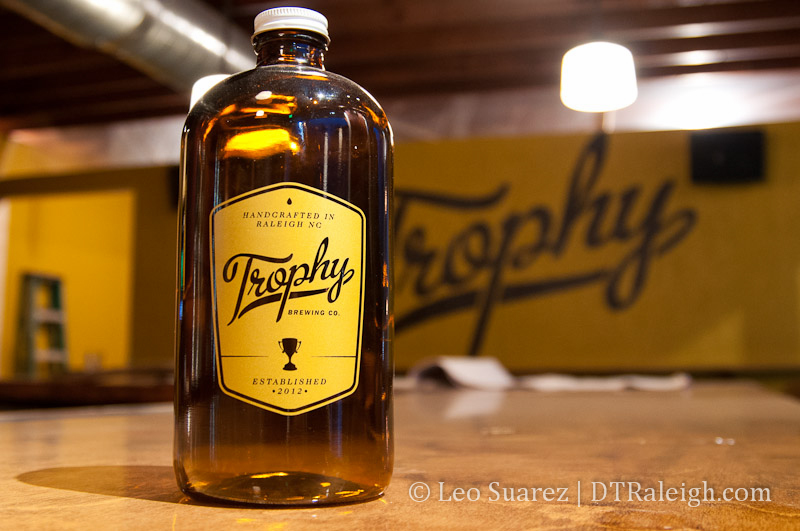 Unique to Trophy is also the option of a 32 ounce growler, pictured above. The thought is that smaller amounts will serve drinkers better than the typical 64 ounce sizes since growlers are essentially an open beer bottle so freshness takes a hit. The new bar will cater to the occasional beer drinker as well. A full bar and some wine will also be available. At first, the new place will be open from 5pm to midnight, Sunday to Thursday and closing at 2am on Friday and Saturday nights. Later this year, expect the entire space to be opened up for more guests as well as some outdoor seating and a kitchen. Food items will include pizza and sandwiches as well as expanded lunch hours. Downtown’s Warehouse District is now getting into the brewing process. Crank Arm Brewing Company will open this spring in the former White Collar Crime location on West Davie Street. Beer is delivered via rickshaw or waste veggie-oil powered truck in order to minimize the company’s impact on the planet. Crank Arm’s Future home as seen in December 2012. In addition to brewing, there will also be tasting on Davie Street as the space will include a bar. The brewery will open with two staple brews; the Rickshaw Rye, a Rye India Pale Ale, and the White Wall Wit. Four other seasonals will be rotated to give drinkers something new to look forward to throughout the year. Up until their opening, Crank Arm is giving away rewards for anyone that helps them through their kickstarter campaign. Watch the video below and back them. If you’d like to try some Crank Arm beer, head down to Raleigh Times tomorrow for their event celebrating the kickstarter. Date/Time: Fri., Jan. 25 from 5 p.m. to 8 p.m. Cheers to all the beer fans out there! I know I’m looking forward to the new spots.